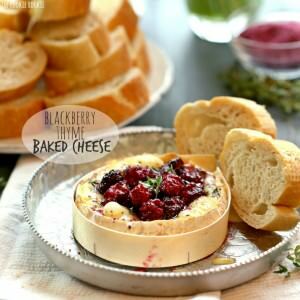 Blackberry Thyme Baked Cheese...A romantic and delicious baked cheese appetizer perfect for Valentine's Day! Take the cheese out of the wrapping and cut the top rind off, cutting only about 1/4 inch down, just to take off the top rind. Place the cheese back into its wooden box, or directly on a parchment lined baking sheet, rind side down.